this is a blog called geometricsleep. 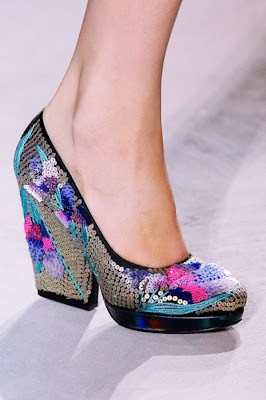 : Best of Spring 2011 SHOES! 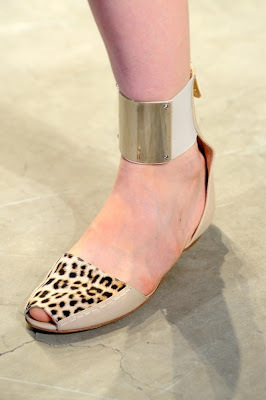 Best of Spring 2011 SHOES! We'll start low and finish super high. Giambattista Valli's leopard peeptoe flats are the perfect summer shoe but if you fancy something tougher, then Balenciaga's rockabilly inspired buckled boots. And now let's get into the platforms! Flat ones made quite the appearances which I'm totally stoked on because these are perfect for stomping around the city in comfort. 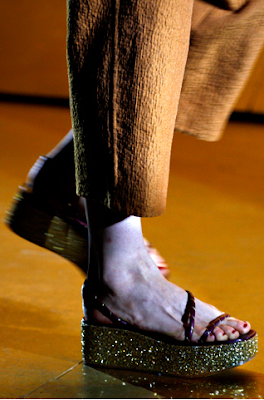 There were sparkly platforms at Marc Jacobs and crazy strappy ones (with what I'm imagining is an all-over pearl print, because how awesome would that be?) from Chanel. 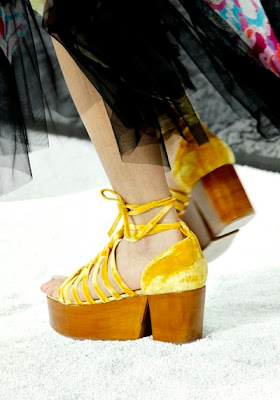 Chanel also did a super cute version in yellow velvet with a little cutout in the platform, but those weren't NEAR as awesome as Acne's CRAZY faceted wooden platforms. I love that they never disappoint with their ridiculous shoe offerings. At Fendi the platforms got a mixture of colors and textures and I'm especially into the leather strap that goes around the ankle and covers a bit of the wedge. 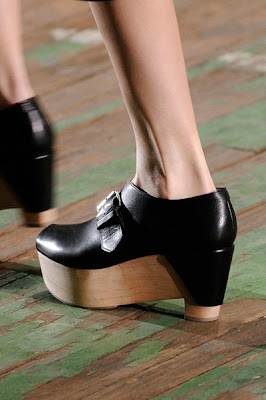 In a similar style, Phillip Lim's weird quasi-tromp l'oeil amish-buckle shoes are too good for words. That little triangle of leather covering the back of the wedge and insinuating a deconstructed heel is truly something else. From stark minimalist wedges to super embellished nature-inspired ones. We all flipped for Rodarte's carved wood slingbacks back in September but Sarah Burton's over the top gold sculptures at Alexander McQueen seem to be even more of a fantasy. I'm not usually a fan of the mid-heel but when its covered in a crazy mish-mash of prints and textures then the heel is the least of my concerns. Both Missoni's bulbous heel and Meadham Kirchoff's exquisitely beaded and embroidered sandals would find a home in my closet. 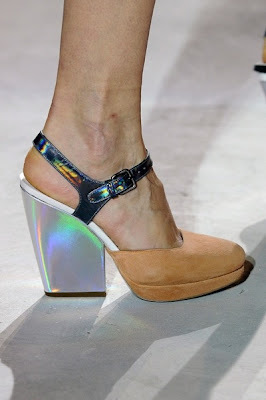 A tribal-inspired sandal at Reed Krakoff and a futuristic mix of materials and textures at Christopher Kane. 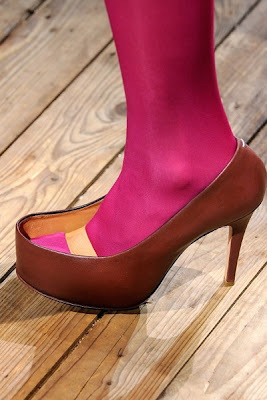 At Jil Sander the heel was so chunky it was almost a wedge. I loved both the mix of suede and metallic textures as well as the all-over tropical sequin print. 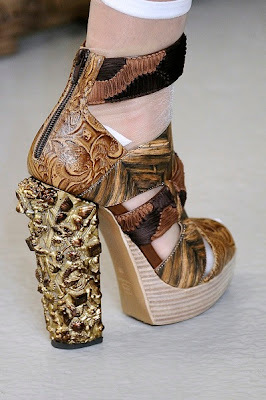 Rodarte also did their wood carvings on super chunky heels complete with wood-grain leather straps (I need wood grain everything in my life). At Versus Christopher Kane did the best update on the 90's mary-jane with floral prints and cool intertwined t-straps in a pointy spectator style (and the kitchen sink, yeah, but they are great!). 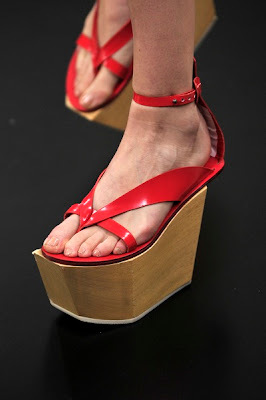 And we end with some re-inventions of what a shoe is supposed to look like via Maison Martin Margiela and Phillip Lim. All these shoes are awesome, sure, but only one woman went above and beyond in bringing all my wildest shoe dreams come true. Yup, you guessed it, it was Miuccia. At Miu Miu colors were given free reign to be as bright and ridiculous as they wanted. Buckles, laces, geometric insets, everything lives together in harmony, ready to take all your outfits to the next level. But it was at Prada that everything really went to another level. 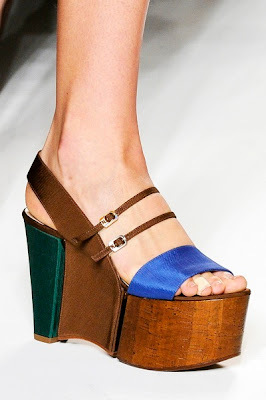 The multi-color, multi-platform shoes that came in flat and super high versions are obviously THE shoe of the season. I would be lying if I said I'm not secretly plotting on making those oxfords mine. But wait, there's more! The perfect silver mary-janes are here and they are wonderful. The raffia woven shoes are quirky and retro. This really feels like a collect-them-all situation, a pair of spring Prada's for every day of the week. i saw those silver pradas in vogue and nearly keeled over from want. the yellow velvet w/wooden heels for chanel was adorable, i also loved the orange + green tree frog-esque heels at Kane, and that crazy silver platform mary janes. SO GOOD! oh my lord I am SWOONING. Those Christopher Kane heels! 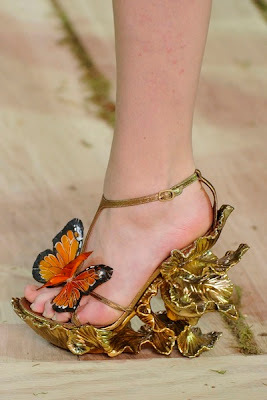 The McQueen fantasy woodland gold epics! AND OH MY GOD THE BLUE/WHITE PRADA MARY JANES. I'm already planning on getting a pair of the Balenciaga's. 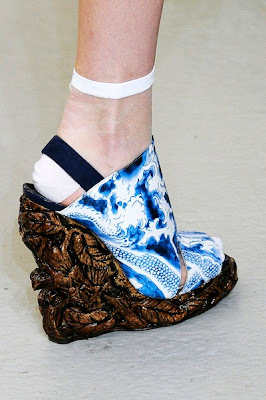 The McQueen's even make your foot look pretty ;). I agree about the Prada oxfords, and Kane's update on the mary jane is perfection! 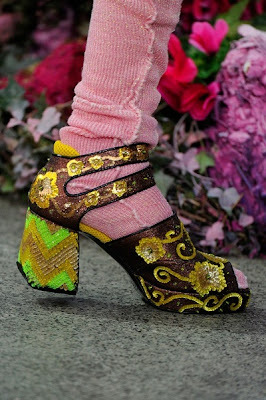 Meadham Kirchoff, MARRY ME. Then we can go on to create amazing and stupendous sock-shoe combinations together and travel the world, spreading enlightenment, or something. Yesss. This was a really good post. I loved every single Chanel shoe this season, and the Prada creepers are some of my favorites too. 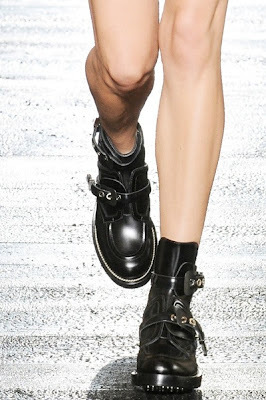 I hadn't noticed those Balenciaga shoes until I saw this, but now I want them. Really love those gold butterfly ones- wonder how much they are?! The Versus Maryjanes are so perfect they make my heart hurt. It's like falling in and out of love and back in again for the first time. Please, please be mine soon! I am a little late to visit this post, but it is my first time visiting your site. Now a follower though! I found you after googling miu miu spring 2011 shoes, I am doing a fashion illustration on a miu miu looks and these were the perfect shoes! Check back on my blog for the finished product next week!